Originally published in Shelf Awareness for Readers. Reprinted here with permission. Debut novelist Flynn Berry delivers a tightly paced and impressive story of psychological suspense. 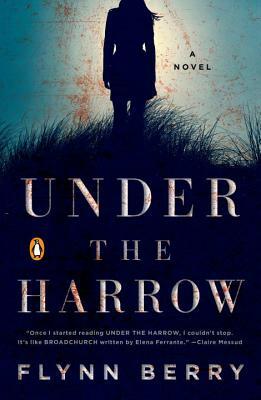 Under the Harrow begins as a straightforward murder mystery: in the English countryside, Nora enters her sister Rachel's house for a Friday night dinner and finds both Rachel and her dog brutally murdered. But as the search for the killer unfolds, Under the Harrow becomes spectacularly complex. Flynn Berry carefully builds the story around Rachel's and Nora's lives with intricate details that connect perfectly, and often in surprising ways. Nora and Rachel are puzzle pieces that don't fit together: Rachel was brutally assaulted as a teenager and has been obsessed with finding her as-yet unidentified attacker; Nora leads a purposeless, meandering life tainted by guilt over her role in her sister's attack all those years ago. These elements combine to make Under the Harrow much more than a straightforward whodunit; the novel, Berry's debut, is a nuanced story of grief, loss and the aftermath of trauma. After finding her sister's body, Nora spends much of her time looking back: "I want to tell her about the moment between opening the door of the house and understanding what had happened," reflects Nora, "when what I felt was wonder." As Nora desperately attempts to identify her sister's killer, she relives and redefines her relationship with Rachel, and her understanding of her place in the world. Under the Harrow is a stunningly complex novel of psychological suspense, exploring the bonds of sisterly love and rivalry through the lens of two brutal acts of violence--introducing an exciting new voice to the genre.